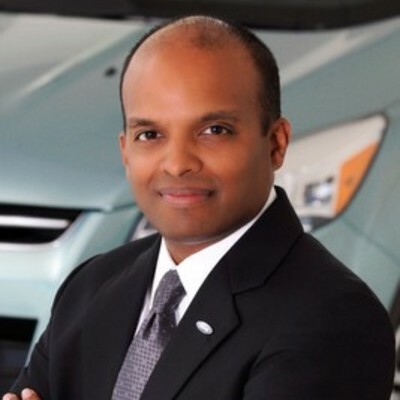 Raj Nair is Ford Motor Company’s Group Vice President, Global Product Development and Chief Technical Officer. Nair has global responsibility for all aspects of Ford Motor Company’s product development system and research and advanced engineering. In his previous role as Ford Motor Company’s vice president of Engineering for Global Product Development, Nair oversaw all engineering for car, truck, SUV and crossover vehicles for the Ford and Lincoln brands, and was responsible for delivering on Ford’s commitment to offer more new products faster than ever before by leveraging greater sharing and reuse of platforms and components globally. He also helped lead the development and implementation of the Ford brand DNA. Prior to this role, Nair served for three years as vice president, Operations, of Ford Motor Company’s Asia Pacific and Africa region. In this position, he was responsible for Product Development, Manufacturing, Purchasing, Quality and Information Technology within the Asia Pacific and Africa region. Nair has held a number of senior positions in Manufacturing, Product Development and Purchasing. He previously was executive director, Commodity Business Planning, where he led a cross-functional team responsible for improving Ford’s material cost competitiveness. Prior to that, Nair was executive director, North American Product Development, responsible for the engineering and development for all truck and SUV programs including the Ford F-Series, Explorer and Expedition. In 2000, Nair was appointed director, New Model Programs, Advanced & Manufacturing Engineering, Vehicle Operations. In this position, he was responsible for all Ford North American Vehicle Operations launches, oversaw the New Model Programs Development Center and helped reinstitute Ford’s Launch Quality Operating System. Nair joined Ford Motor Company in 1987 as a Body and Assembly Operations launch engineer and held various positions on more than 11 vehicle programs in 13 assembly plants. On assignment to Europe, Nair was the Vehicle Operations launch manager for the 1996 European Fiesta. He then became responsible for all Ford of Europe launches including the Focus, Transit and Mondeo. Nair holds a bachelor’s degree in mechanical engineering with an automotive specialty from Kettering University in Flint, Mich., and was named the recipient of the 2012 Kettering Alumni Award for Management Achievement. In 2014, he was named the Fortune Automotive Businessperson of the Year. In addition to his duties at Ford, Nair serves on the board of directors of the Michigan Science Center and Kettering University.